An old (mid-90s) both/marketing sign I had hanging in my office for years. 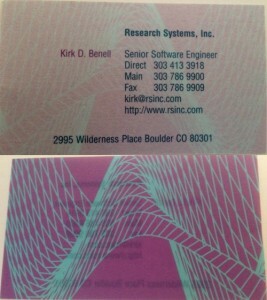 Biz card – really hip for the day (93). 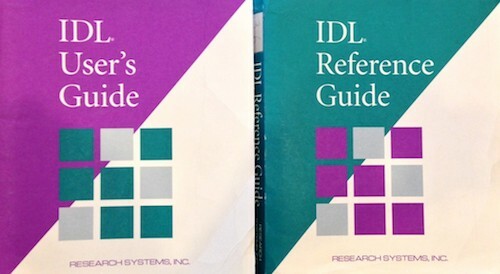 IDL 5.0 was probably 9 months late. 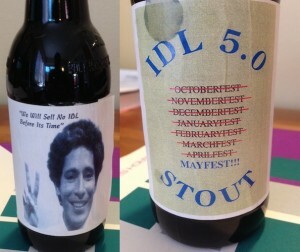 At release, Support handed out Beer with a special label – “Peace Dave”. 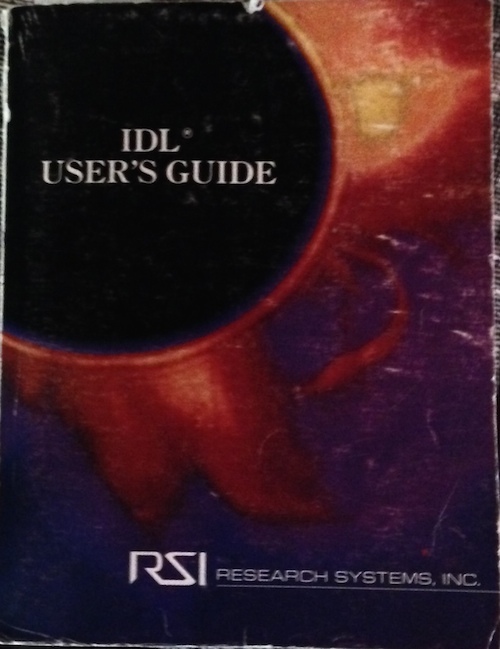 The IDL 5.0 Manuals had this terrible cover — Most thought it ridiculous. A one-of-a-kind key ring – a local vendor made an example of items for RSI. I somehow ended up with the sample keyring! 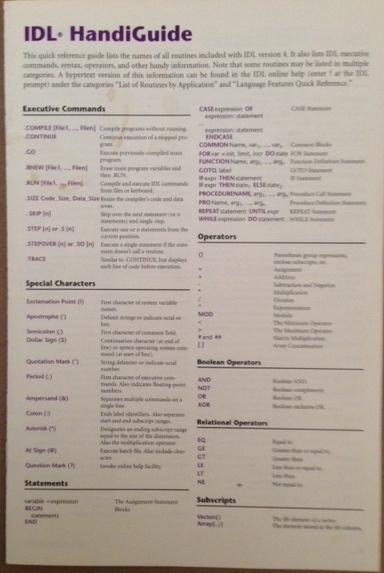 Manual from the early days – probably one of the first I used. 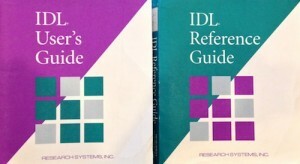 The first appearance of IDL Widgets came via this Addendum. 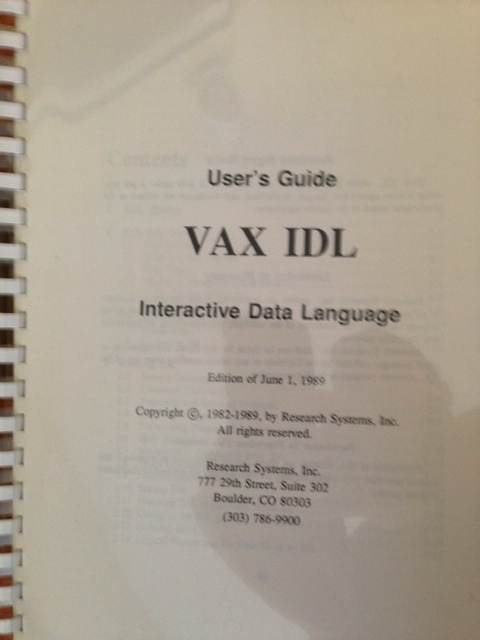 Oh, and you hand to start IDL with the WIDL command on VMS. 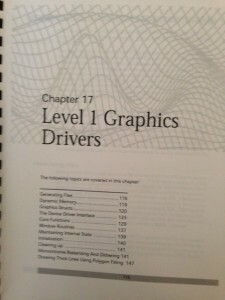 Newer manual — probably from the very early 90s. 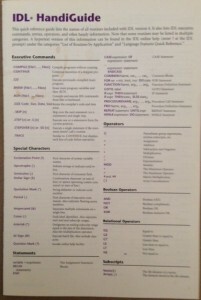 LOVE the RSI Font! 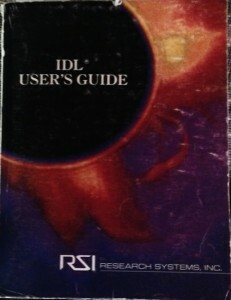 An extensively used Internals manual – early 90s. 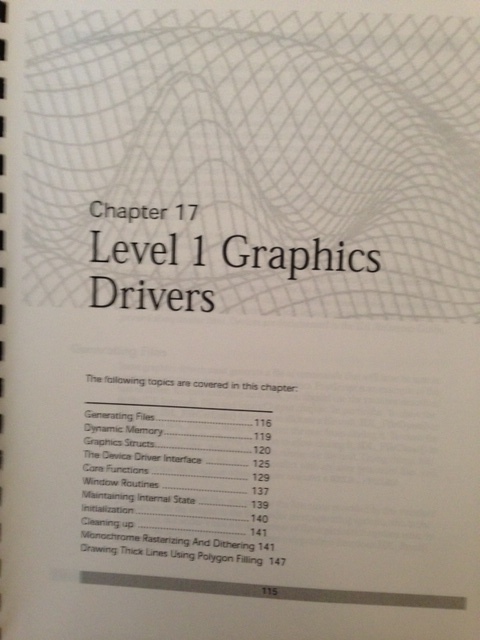 Old graphics (Direct Graphics – which we called level 1 internally). 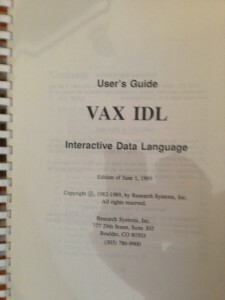 I used this to write the initial ION implementation at home (used a graphics driver to pump commands down a socket to the client Java Applet!). 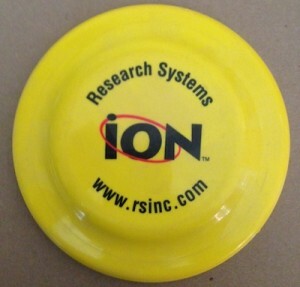 One of give aways for ION was a small frisbee! The problem with the frisbee was if you turned it upside down, it looked like NO! 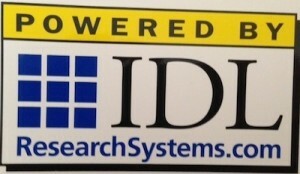 Famous “Powered by IDL” sticker. 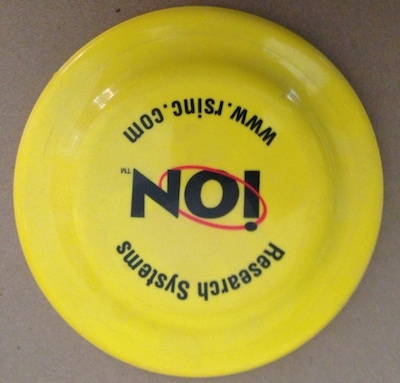 I still have at least 50 of these things. Note the domain name change from rsinc.com to ResearchSystems.com — a new Marketing director was hired and I think this was the big thing she did. 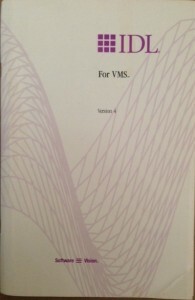 VMS installation manual. 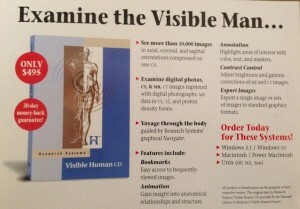 Even installing software required a 20 page manual back them. 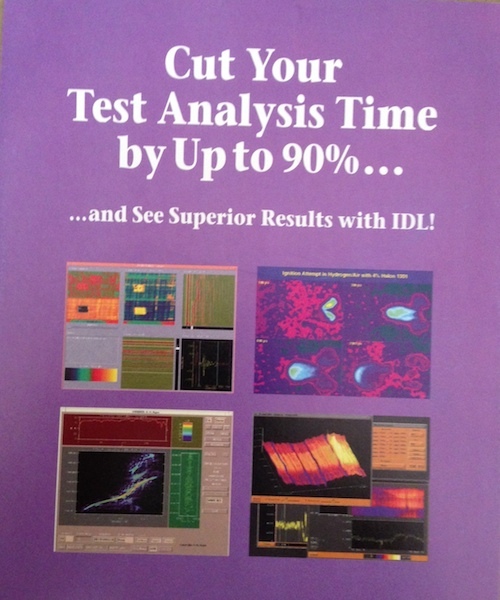 Mid/late 90s company slogan – after “Software for Science”. There was a big internal contest for the new slogan – this was proposed by Dave S and won! (I remember people felt it was rigged at the time — but it wasn’t). 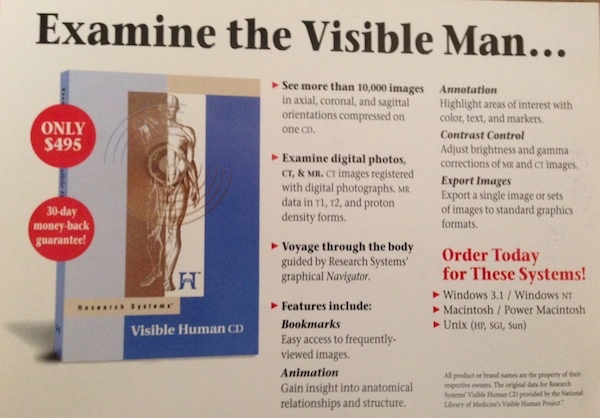 In an effort to expand, we created the “Visible Human CD” – images from the Visible Human project — they froze a human, sliced off thin layers and took high-defnition images after each slice. 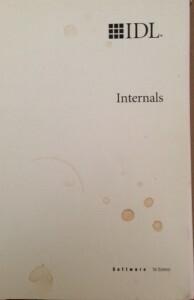 Sure, a little gruesome, but very interesting. 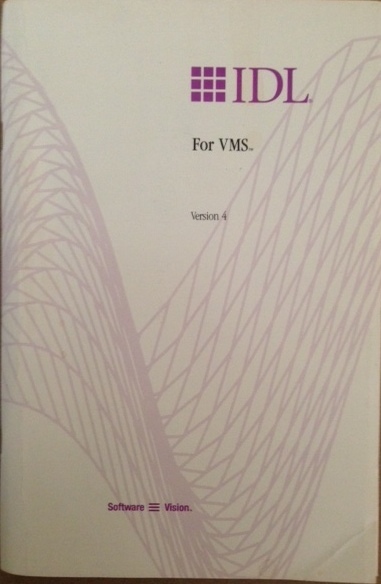 Late 90’s/early 2000s logo – incredibly ugly. Internally referred to as the “Duck head”. 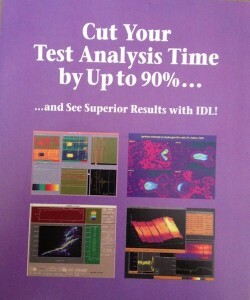 This was probably created right after the Kodak purchase of RSI. It was amazing how fast things went downhill after this purchase.